Like so many other megachurch parsons, James MacDonald has run from taking responsibility for whatever sin he’s engaged in. The elders of Harvest Bible Chapel announced Wednesday (Jan. 16) that pastor James MacDonald would take an “indefinite sabbatical” from preaching and leadership at the Chicago megachurch while it works to reconcile with past critics. The decision came after the church’s Executive Committee of the Elders held a closed-door meeting on Monday and presented its recommendations to the entire Elder Board Tuesday night. The announcement follows recent reports of criticism of the church’s financial and management practices. The elders said MacDonald has permission to continue preaching at the Harvest location in Naples, Fla., this winter but he has recused himself from having any leadership role in the reconciliation process and will participate only when asked. These guys are always so evasive and always refuse to repent with any sense of sincerity and clarity. They are a blot on the body of Christ and a cancer. If you go to a megachurch chances are pretty darn good that your Pastor is a sketchy somebody who will be found to be such in due course. 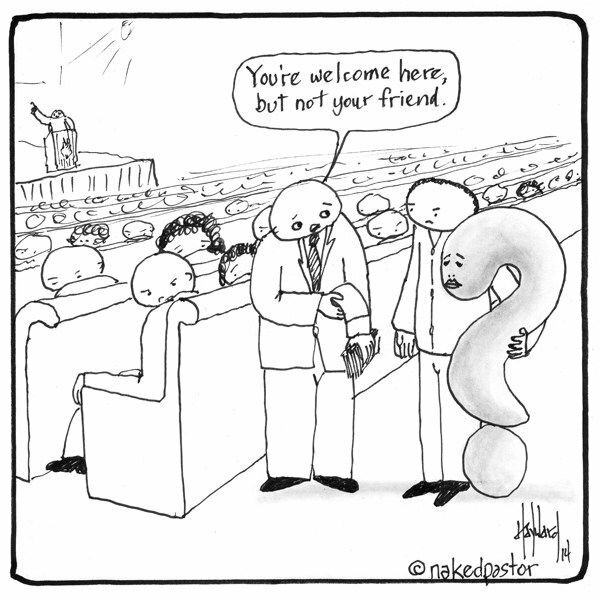 Get out and attend a real church where the Pastor actually knows who you are. What’s going on here? 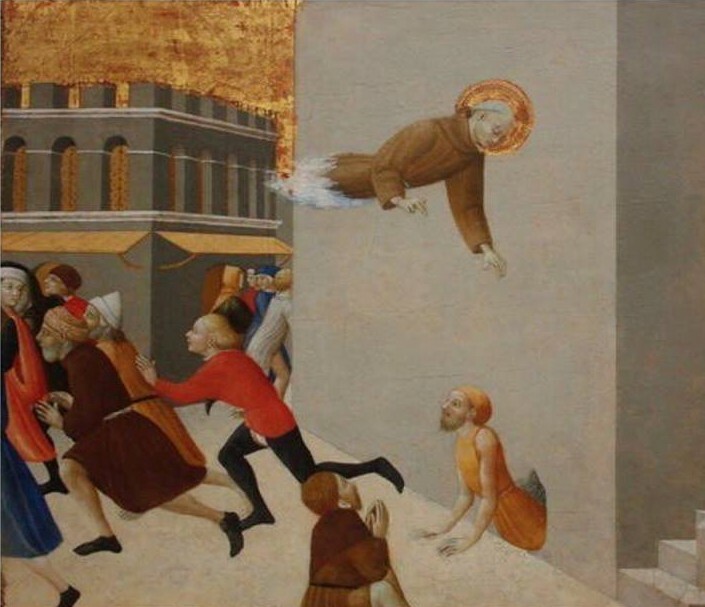 Why is the floating saint floating and why does he have a jet engine for a lower half? I am full of Yahweh’s wrath, I am weary of holding it in. Then pour it on the children in the streets, and on the bands of youths as well, for husband and wife will both be taken, the greybeard and the man weighed down with years. Their houses will pass to other men, so will their fields and wives. Yes, I shall stretch my hand over those living in this country, Yahweh declares. For, from the least to greatest, they are all greedy for gain; prophet no less than priest, all of them practise fraud. Without concern they dress my people’s wound, saying, ‘Peace! Peace!’ whereas there is no peace. Senate Republicans have announced the Senate will be effectively shut down the next 10 days. A total disgrace. That means this moronic and evil government shutdown isn’t ending soon. Call your Senators and let them hear your unbridled rage and a good old fashioned tongue lashing. So far as God is concerned those who withhold wages are on par with sorcerers, adulterers, perjurers, and those who oppress widows and orphans as well as those who mistreat foreigners. You Trumpians are in big trouble. 1- why don’t the Pharisees take issue with it? 2- why do none of the Gospels feel compelled to defend it? 3- why does Paul never feel compelled to answer criticism about it? 4- why does not a single document from the early Church attempt to justify it? In short, no one took notice of Jesus’ female disciples because it was no big deal. It wasn’t new, it wasn’t unique, and it wasn’t special. [There exists] a letter to Zwingli, dated January 18, 1530, wherein two Swiss in the service of the King of France offer their services to bring about a conference between the representative of the King and of the Zurich allies (viii., 397). The Landgrave of Hesse took great interest in this mission (cf. his letter of February 1, 1530, viii., 404 sqq.). As these negotiations were delicate, the Landgrave and the Duke of Wurtemberg in writing to Zwingli employed arbitrary signs in their letters to designate certain persons, mostly sovereigns, and also the correspondents themselves. Cf. letter to Zwingli of February 14, 1530 (viii., 411)(SM Jackson). The Reformation wasn’t just of interest to theologians. It was of interest to politicians as well, for less than theological reasons. In the middle of January, 1525, Zwingli and the other Pastors in Zurich were in a pitched battle against the radicals who were then urging their followers to abandon the Reformation and speed ahead with a total severance from society. 1525 would become the year during which Zwingli spent the majority of his time battling these ’causers of unrest’. Indeed, things had already developed to such a threatening level to the well being of the city that in December the year before Zwingli had written his scathing Wer Ursache gebe zu Aufruhr. 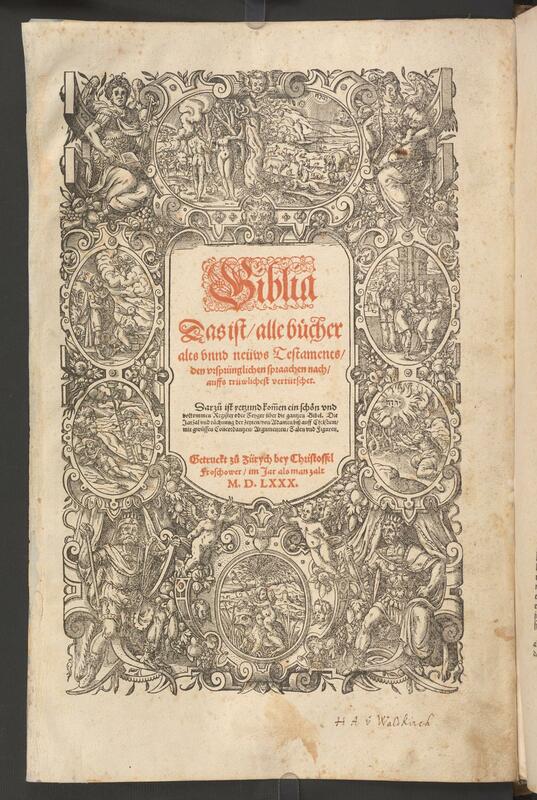 In March of 1525 Zwingli published De vera et falsa religione commentarius, which took a swipe at both the old believers and the radicals. In April the trial of some rebaptizers was observed by Zwingli; in May his Von der Taufe… appeared. In June, Von den Predigtamt took to task those asserting pastoral and preaching privileges even though they lacked the appropriate tools. And in November, the Antwort über Balthasar Hubmaiers Taufbüchlein saw the light of day. All of these books were ‘conflict’ oriented and 1525 was perhaps the most conflict ridden of Zwingli’s life. And that doesn’t take into account the opening of a front against an inaccurate understanding of the Lord’s Supper which was then developing and would come to a head at Marburg in 1529. Notwithstanding all these disputations and difficulties, Zwingli maintained a cheerful disposition. Depression and despair would stay away until 1531, when early in the summer, he would try to resign. The historically ignorant to this day constantly insist that the Radicals were chiefly interested in infant baptism and its abolition. This is not the case. Nor is it the case that they insisted on baptism by immersion- since they were happy both to sprinkle and to pour. No, their aim was far more inappropriate: they wanted a Church separated from society. The first and chief aim of the Radicals was not (as is usually stated) the opposition to infant baptism, still less to sprinkling or pouring, but the establishment of a pure church of converts in opposition to the mixed church of the world. The rejection of infant baptism followed as a necessary consequence. They were not satisfied with separation from popery; they wanted a separation from all the ungodly. They appealed to the example of the disciples in Jerusalem, who left the synagogue and the world, gathered in an upper room, sold their goods, and held all things in common. They hoped at first to carry Zwingli with them, but in vain; and then they charged him with treason to the truth, and hated him worse than the pope. 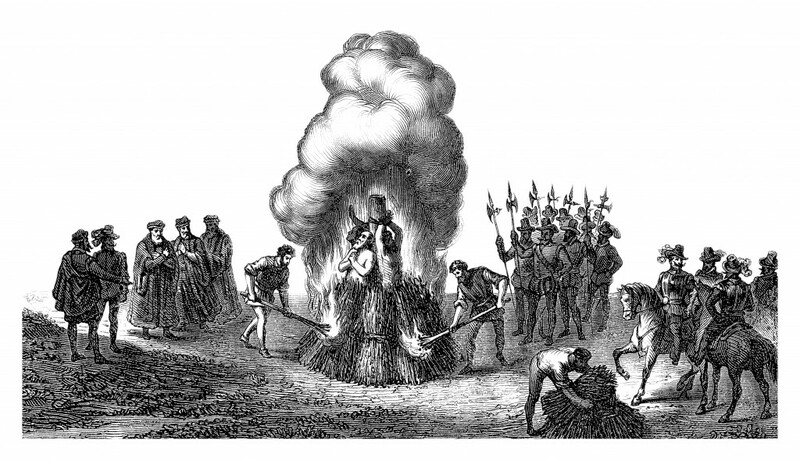 Zwingli could not follow the Anabaptists without bringing the Reformation into discredit with the lovers of order, and rousing the opposition of the government and the great mass of the people. He opposed them, as Augustin opposed the schismatical Donatists. He urged moderation and patience. The Apostles, he said, separated only from the open enemies of the gospel, and from the works of darkness, but bore with the weak brethren. Separation would not cure the evils of the Church. There are many honest people who, though weak and sick, belong to the sheepfold of Christ, and would be offended at a separation. He appealed to the word of Christ, “He that is not against me, is for me,” and to the parable of the tares and the wheat. If all the tares were to be rooted up now, there would be nothing left for the angels to do on the day of final separation. The Radicals couldn’t and wouldn’t tolerate such sensibility. So they stirred civil unrest. That the authorities could not tolerate, and the Radicals reaped the whirlwind.